A renewed dedication to the bot lane makes RNG a major contender at MSI. As Jian “Uzi” Zi-hao walked on stage in Chengdu China last month as a winner for the first time, the emotions nearly overcame him. When one of his coaches held the giant, gleaming LPL Spring Split championship trophy in front of him, Uzi pushed it away, as if he couldn’t believe that it was finally his. Then he grabbed it with both hands, held it aloft, and let out a primal scream to an adoring and raucous crowd. He had finally done it. 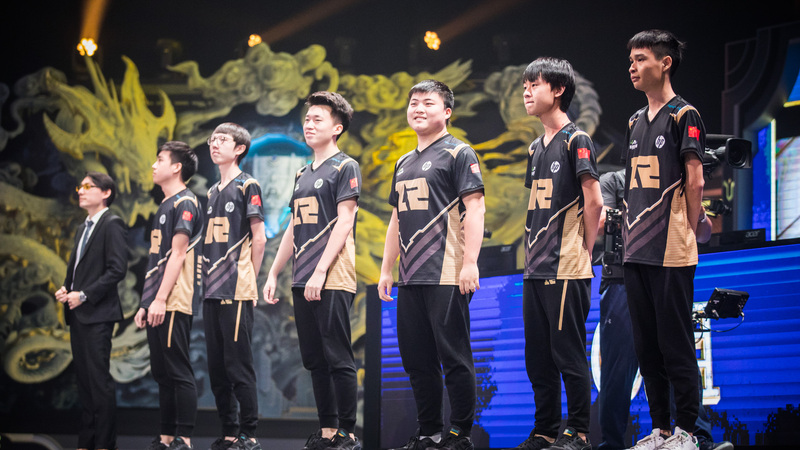 After years of heartbreaking second-place performances, Uzi finally won a title last month when Royal Never Give Up defeated EDG in the LPL final and claimed their place at MSI. That’s the reaction only a player as beloved as Uzi can receive upon bringing home a title. But that was still just the LPL championship. Can you imagine what the reception will be like if Uzi and Royal can win MSI? Of course, Royal have been to MSI before. But in a cruel twist of fate, Uzi wasn’t with the team in 2016 when they defeated EDG for the chance to represent China in front of the world. It was another chapter in the heretofore tragic history of China’s best player. Uzi went back to the team the next split, but the fit just wasn’t the same as it was before. Uzi is the ultimate carry player: getting him fed almost guarantees victory. But in his time away, RNG figured out how to play through the other lanes, especially mid laner Li “xiaohu” Yuan-hao. By the time Uzi went back, RNG was firmly Xiaohu’s team. The evolution made sense: playing blindly around bot-side priority is no path to sustained success. As Royal’s enemies, EDG in particular, figured out how to beat them early, RNG found themselves unable to catch up. RNG belonged to Xiaohu, but what role did that leave for Uzi? The next year, 2017, Uzi was rotated in-and-out of the lineup as RNG struggled to figure out what to do with the veteran star. Then, another shift in the winds, this time for the better. The Ardent Censer meta meant carry marksmen were back, and Uzi became the focal point once again. He dominated Worlds and led his team to the semifinals. But that’s as far as they would go. Uzi and Xiaohu couldn’t overcome two-time defending champs SK Telecom T1. Few could—before SKT’s shocking loss to Samsung in the final, it seemed like they would never lose. And so Royal’s path to a trophy ended early yet again. That run to the semifinals was the best we’d seen RNG play, but this year, they may have reached a new level. Getting his hands on carries seemed to ignite a fire under Uzi, and he’s taken the LPL by storm this split. It helps that the meta is still heavily focused on winning bot lanes, but even so, he’s been a monster. He’ll need to somehow be even better if Royal wants to win MSI. The ADC talent at this event is absolutely crazy. Kim “PraY” Jong-in, Martin “Rekkles” Larrson, and Yiliang “Doublelift” Peng are each superstars in their own right. This is the greatest pool of ADC talent that MSI has ever seen. As is often the case when star ADCs clash, their teammates may be the ones who tip the scales. After years of going back and forth over how much to prioritize Uzi, Royal seem like they’ve grown more and more comfortable with their playstyle. Xiaohu has played more team-friendly champs like Vladimir, Sion, and Galio as he’s let Uzi take back the reigns. Their macro can still be questionable at times, but their teamfighting ability is better than ever. It will be a tough path forward for the LPL squad. KINGZONE are playing like absolute monsters. But Royal won the LPL as underdogs in their last couple series. Maybe after years of disappointment, all Royal needed was to come from behind. We’ll see at MSI just how strong the chips on their shoulders have made them.